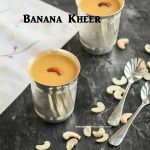 Orange Paneer Kheer / Orange Paneer Payasam is a delicious payasam that can be made with the easily available ingredients. I simply loved the payasam. I am sure anyone would surely fall in love with it so as i am. Orange and Milk sometimes sounds like they dont go well with each other. But trust me this payasam was simply super delicious. It was creamy and a citrus blast. Todays “Protein Rich” ingredient is going to be paneer. 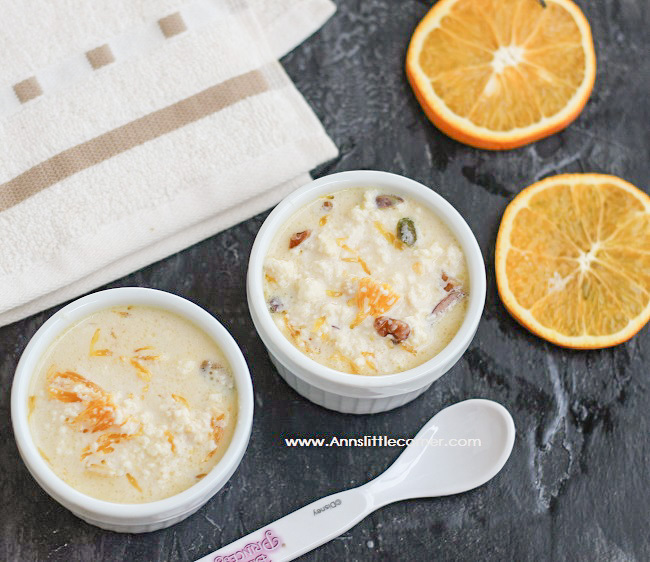 Orange Paneer Kheer / Orange Paneer Payasam is a simple rich creamy and delicious dessert. Peel oranges. Remove all the white portion from the orange. Heat ghee in a wok. Roast the nuts. Remove the nuts from the ghee. Add in the boiled milk. Bring it to boil. Add in Condensed Milk and bring it to boil once again. Add in Scrambled paneer and cook for few mins. Switch off the flame and add in the roasted nuts. Allow the kheer to cool down. Add in the oranges and allow to refrigerate for atleast 30 minutes. 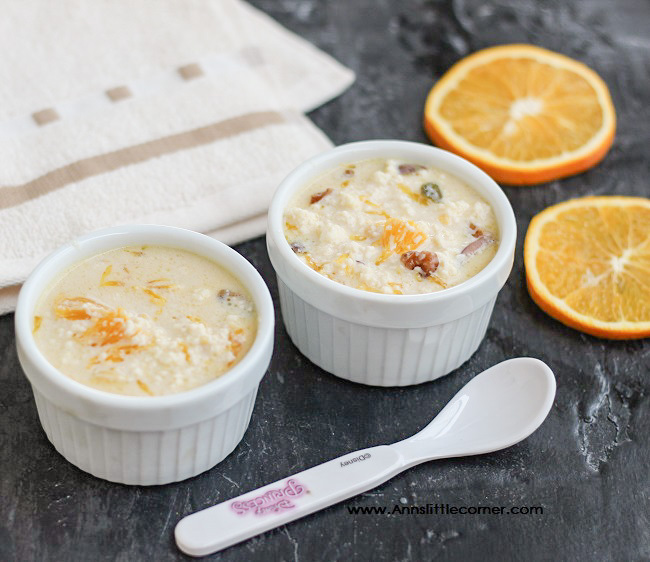 Orange Kheer tastes best when served chill. Condensed milk can also be replaced with sugar. Raisins can also be added and roasted along with nuts. Heat ghee in a wok. Add in the chopped nuts. Roast them. Remove the nuts from the wok. Add in them milk along with ghee and bring it to boil. Add in the condensed milk and again bring it to boil. Add in scrambled paneer and cook for 3 to 4 minutes. Switch off the flame and add in the chopped nuts. Allow the kheer to cool down completely. Peel the orange and remove all the white portion from it. Add the orange into the kheer. Orange Paneer Payasam tastes best when served chill. It’s just like Bengali kamalebur kheer plus the paner. Looks very delicious and you have presented it very beautifully. Excellent kheer ! I have made paneer kheer , orange kheer , but not a combination of the two . I am sure this must be really delicious , I fact I am getting all the flavours ! Too good ! I love paneer in payasam. This additio of oranges makes it more delicious. And as usual super inviting clicks. Wow what a delicious and yummy kheer. I love the addition of oranges. Lovely kheer with awesome combination of flavors.. Came out really very well!! I’ve never tried paneer kheer. Yours looks super tempting with the added orange. Wow awesome… Oranges in milk sound interesting. Will it curdle pa? I see that you are adding it towards the end.. Citrus flavor in kheer, wow adding it to my bookmarks. 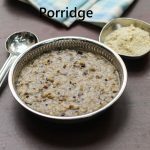 ya Srividhya it would cuddle if we add it when it is hot. But here oranges are added only when the kheer is completely cooled down. I have seen this kheer minus the paneer. This is an excellent recipe! Orange and paneer in kheer, thats totally very unique, have already oranger kheer and paneer kheer separately but never together. Now am ready to make some soon. my little one loves oranges so must make this for her. bookamarked this too ! That’s a very innovative idea! I have some oranges to be used up. Will try this recipe. 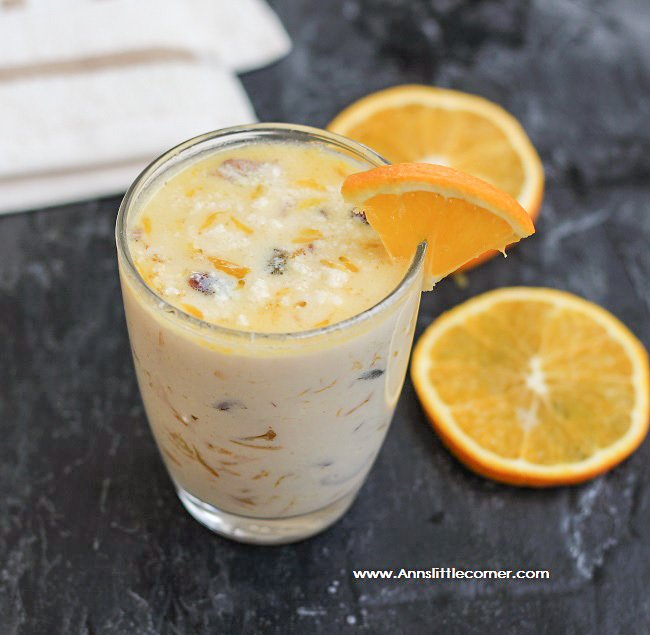 Nice and excellent kheer with orange and panneer..Sounds inviting. very good combo – paneer and orange. Should try this.